A chronology of key events surrounding the arrest and trial of Kurdish leader Abdullah Ocalan, with links to the main stories from BBC News Online's coverage. The European Court of Human Rights issues a non-binding ruling that he did not receive a fair trial and his human rights were violated by the delay in bringing his case to court. The state security court in Turkey commutes Ocalan's death sentence to life imprisonment. The European Court of Human Rights grants Ocalan leave to appeal against the death sentence imposed by Turkey. The European Court of Human Rights adjourns Kurdish rebel leader Abdullah Ocalan's appeal against the death penalty. The Turkish Government suspends the death sentence on the Kurdish rebel leader at the request of the European Court of Human Rights, pending its review of the case. Appeal court judges uphold the death sentence imposed on Abdullah Ocalan, but his lawyers say they will take the case to the European court of Human Rights. Lawyers for Abdullah Ocalan go to court in an attempt to get his death sentence overturned. Ocalan, meanwhile, remains incarcerated on the prison island of Imrali, south of Istanbul. 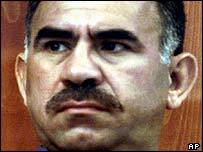 Kurdish rebel leader Abdullah Ocalan is sentenced to death for treason. The trial resumes, and Abdullah Ocalan makes his final statements in a last-ditch attempt to avoid execution. The Turkish parliament votes overwhelmingly in favour of amending the constitution in order to remove military judges from the country's state security court system. Following a three day adjournment, prosecution lawyers sum up their accusations against Mr Ocalan and renew their demand that he be executed for treason. Proceedings end in uproar with the expulsion of the prosecution team and the panel of judges ordering a three-day adjournment for preparation of final arguments in the case. The defence team boycott proceedings, complaining that they and Mr Ocalan's relatives have been ejected from their hotel after receiving death threats. As Abdullah Ocalan's trial continues, the widow of a Turkish soldier murdered by Kurdish rebels confronts Abdullah Ocalan in court. On the second day of his trial, Abdullah Ocalan says the PKK received support from several countries in the past, including Greece, Syria and Iran. The trial of Abdullah Ocalan on charges of treason and attempting to divide the state by force gets under way on the heavily-guarded Turkish prison island of Imrali. A Turkish judge charges Abdullah Ocalan with treason and attempting to divide the country. His first formal court appearance, before a single judge and no jury, is closed to the press. The Ocalan arrest has had political consequences far beyond Turkey - the centre of the PKK's struggle for a homeland. The arrest provokes protests by Kurds around the world. Abdullah Ocalan is captured and flown to Turkey in unexplained circumstances after turning up at the Greek Embassy in Nairobi, Kenya. Mr Ocalan's appearance in Kenya follows a month-long mystery surrounding his whereabouts, and after repeated requests for political asylum in Europe were rejected.